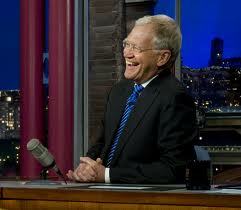 I was saddened to read that David Letterman has announced his retirement. Okay, he still has a year to go, and this announcement was not entirely unexpected but I, and I suspect many others, still felt a deep sense of loss. I remember a time when I was sitting in the pub with some friends discussing our favourite comedy shows. When I mentioned The Late Show with David Letterman everybody groaned. A lot of Brits just don’t get the exaggerated show-business style, the one-liners where you can see the punchline coming but laugh anyway, and the occasional outright silliness. Here in Britain we’ve become used to comedies being set on rundown council estates, mundane offices and inner-city parishes. Not that there’s anything wrong with that, and American audiences seemed to have lapped them up, but still, you can’t beat Letterman for sheer shameless, gleeful comedic entertainment. I remember when I was an undergrad and was living in a house with seven other students (which was a disaster but I’ll save that story for another time). No one wanted to watch Letterman at 11 so I had to stay up to 6am to catch it. It would always be worth it for his opening monologue, the Top Ten, the comic sketches, the rapport with Paul Shaffer and Alan Kalter. I was less fussed about who the guests were. Letterman was the star. Alas, I never became famous enough to be a guest on the Late Show, but I would have the opportunity to sit in the Ed Sullivan Theatre watching the show being recorded. Last year I visited New York for the first time. I was there partly to retrace the steps of James Ellroy during a particularly interesting period of his literary career and partly just as a tourist. Walking through Broadway, my wife and I stumbled across the Ed Sullivan Theater with the large picture of Letterman outside it. ‘Let’s see if we can get tickets’ my better half suggested. My English cynicism kicked in. I knew tickets were free but were allocated on a lottery basis and competition must be fierce. Still we put our names down and were told to call back later in the day. As neither of our mobiles worked abroad we called back from a phone box (not easy to find these days), only to be told that we hadn’t been selected. Still, call back tomorrow they said just in case anyone dropped out. We called back the next day merely as a formality, but to our delight we were told we were in. Queuing up in the Ed Sullivan Theater, chatting to Australian tourists, I felt somewhat apprehensive. We had no idea who the guests were and I was terrified that Letterman would pick on me on national television. Regular viewers will know he often engages people in the audience and more than a few of them come across as foolish. The interns (some of whom were quite fetching, no wonder he strayed) briefed us before we took our seats. Letterman feeds off your energy, they said. If he feels the audience is not involved he may hold back some of the best material for another show. We want hearty laughter and enthusiastic applause, even if you don’t find everything funny, but no cheering as it’s a distraction. So, they took us to our seats, and I was taken aback by how small everything was. The stage looks a lot bigger on TV and there were times when I thought the cameraman was going to knock over someone in the band. Before filming began, the audience was fired up with some funny videos and a stand-up comic. Letterman came on to say a few words. This was the only time it felt like he was talking to the audience directly. When filming began he was looking into a camera that was right in front of him, which I assume is a lot less nerve-wracking than looking out at an auditorium of several hundred people. There were TV sets in the auditorium so we could see the show in the same way it was broadcast that very night. The show itself was a joy to watch. The monologue was very funny. The Edward Snowden scandal was in the news and there were lots of jokes about his ‘hot, pole-dancing girlfriend’. One sketch I thought that dragged was trimmed down a lot when it was shown on TV. The guests were Idris Elba and Melissa McCarthy, both of whom were charming, although the films they were plugging looked awful. During the commercial breaks we were treated to several thumping rock songs by the ever-excellent Paul Shaffer and the CBS Orchestra. The closing musical act was Dale Watson and the Lone Stars performing the wonderful ‘I Lie When I Drink’. Leaving the Ed Sullivan Theater that day I felt completely invigorated and overjoyed. Thank you David Letterman.